Welcome to Go Forth And Game. 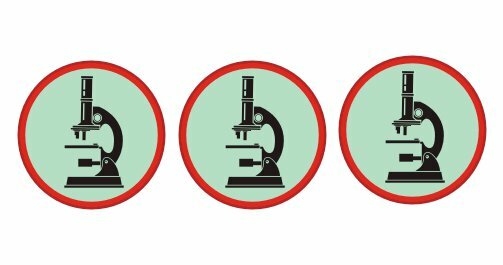 Under The Microscope today – Drop Site from Bellwether Games. This review is long overdue. I received a review copy of Drop Site from Bellwether Games some time back and just have not gotten around to posting it. I apologize because this is a pretty good little card game. Abstract: Drop Site is a quick, fun card game for two to four players. It’s theme of disaster aid workers dropping aid packages into stricken areas is unique. This is a card game that comes with 52 cards and a rules sheet. 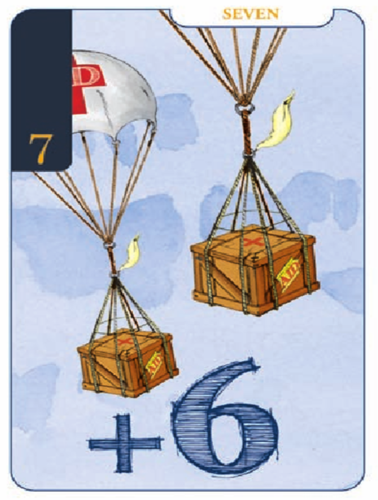 The card art is simple and clear depicting crates parachuting to or already on the ground. Most have a card value on the upper left side as well as in the border at the top right. The main body of the card holds the art and a number for scoring. Card values range from 12 to 0. Zero cards represent on the ground aid. When a zero is played on a Drop Site, that Drop Site is turned on its side and a new Drop Site may be started on top of it. The rules sheet explains the game well. It is clear and concise. The cards come in an industry standard card box with nice art. Game play is fairly straight forward. The cards are shuffled and five cards are dealt to each player. The deck is placed in the center of the play area and the top card flipped to form the first Drop Site. The players then take turns playing a card to either face up to the Drop Site(s) or face down to their Debt Bank. They then draw a new card from the deck. If a player chooses to play to a Drop Site the played card must have a lower card value than the face up card on the Drop Site. Players may choose to start a new Drop Site with their play by playing any card next to a current Drop Site. The face down pile in front of each player is the Debt Bank. Cards are played here and remain until the end of the game. Then they are used for scoring. Play continue until the appropriate number of Drop Sites is reached. This number varies with the number of players. The round then ends. Exhausting the draw deck also ends a round. At round end scoring begins. Points are scored for each card in your Debt Bank. Players receive points equal to the big blue plus number on the cards if the card’s value matches a Drop Site’s value. Players lose two points for each unmatched card in the Debt Bank. Drop Sites with zeros can be matched for both the zero and the current top card. Debt Bank cards can match more than one Drop Site and a single card can match more than one Drop Site. Game play continues until one player scores 100 points. 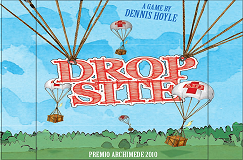 Drop Site was designed by Dennis Hoyle and won the Carda Mundi award of the Premio Archimede in 2010 for best card game. I can see why. I like Drop Site. Bellwether Games has produced a quality game with its first effort. It is a fun, quick filler game with a unique theme and clever scoring mechanism. It is easy to learn but takes a bit of skill to win. The scoring mechanism is the heart of the game. Being able to remember what you placed in your Debt Bank and being able to match it to the Drop Sites is not as easy as it might seem. Scores escalate quickly making the game quick fun. Drop Site is not a deep game nor does it pretend to be. It is exactly what it wants to be – a small, fun game with enough thinky-ness to satisfy. This game is a hidden gem filler game that needs more notice. You can get your own copy of Drop Site here at the Bellwether Games website. Drop Site is normally $10 + shipping. That is a deal for real! Rush on over there and get your own copy. Thank you to Bellwether Games for providing a review copy. Thank you visiting Go Forth And Game. Please come back soon for more interviews and reviews from the world of gaming. For The Win is 90% Funded! For The Win from Tasty Minstrel Games is less than 10% away from being fully funded. This is a fun, quick, brain exercising game that deserves our support. 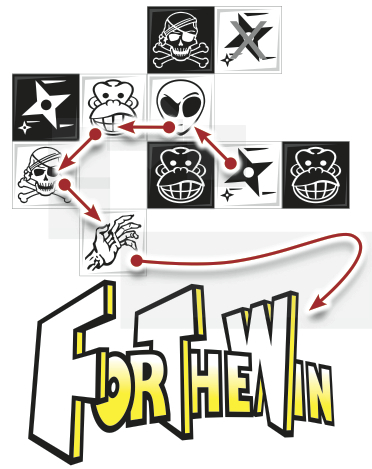 Head over to the For The Win Kickstarter site and help it to be born.